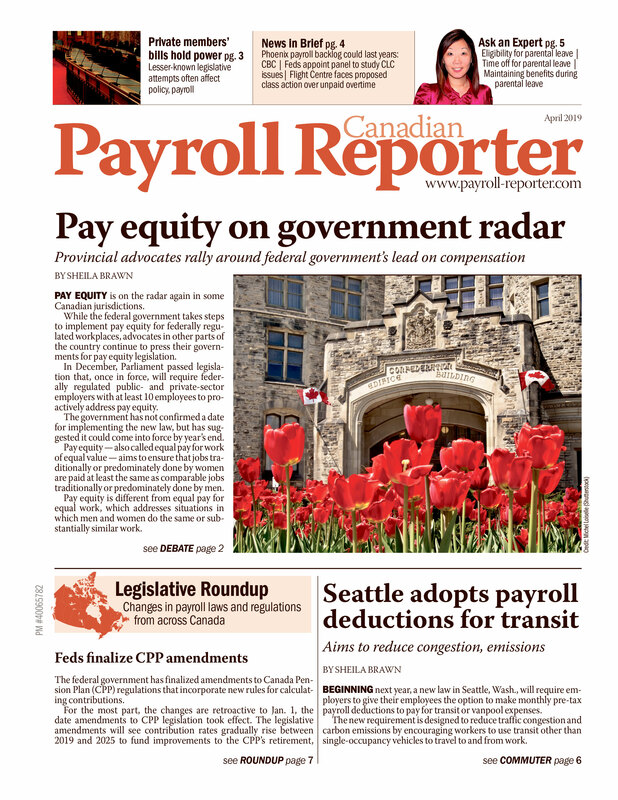 tabled on June 4, proposes a mix of new and previously announced payroll-related measures. It is the Liberal government’s first budget since winning the provincial election in April. The Parti Québécois presented a budget in February, but an election was called before the National Assembly voted on it. For payroll, the budget did not include any proposals to change the contribution rate for the Quebec Pension Plan (QPP) or the premium rate for the Quebec Parental Insurance Plan (QPIP). There were also no changes proposed to personal income tax rates or tax brackets. In addition, the budget did not contain any changes to the rates for employer contributions to the Commission des normes du travail, Health Services Fund (HSF) or Workforce Skills Development and Recognition Fund. It did propose to implement a holiday from paying HSF contributions for small and medium-sized businesses that hire certain specialized workers. The holiday would apply to increases in a company’s payroll that result from hiring the new employees. The holiday would be available and apply from June 5, 2014, to Dec. 31, 2020. To be eligible, a business would have to have an annual payroll of less than $5 million. Companies with payrolls of less than $1 million would be fully exempted from paying HSF contributions on the payroll increase. Businesses with payrolls over $1 million, but less than $5 million would be partially exempted, with the exemption gradually decreasing based on the payroll size. Budget documents show that for an employer with a total payroll of under $1 million, the effective HSF rate for salary paid to a new specialized employee would be zero per cent. For an employer with a $2-million payroll, it would be 0.77 per cent, increasing to 1.74 per cent for a $3-million payroll, 2.9 per cent for a $4-million payroll and 4.26 per cent (no reduction) for a $5-million payroll. The proposed measure would apply to private sector businesses that hire specialized employees to work full-time. These would include those in natural and applied sciences who have the type of diploma usually needed to obtain a job in those fields. Jobs covered would include various types of engineers, chemists, architects, statisticians and web designers. A complete list can be found in the budget documents. The budget also proposes to increase by $1,000 the maximum amount employees can use to calculate a tax credit for older workers, beginning Jan. 1, 2015. The tax credit currently eliminates income tax payable on the first $3,000 of employment income over $5,000 for workers aged 65 and older who remain in the workforce. Older workers can claim the tax credit on a Source Deductions Return. With the proposed increase, the tax credit would be calculated on the first $4,000 of eligible employment income that exceeds $5,000. The purpose of the tax credit is to encourage older employees to continue working to help combat a shrinking labour pool due to an aging population. The government first announced the tax credit in the 2011-12 budget. At the time, it planned to phase in the tax credit over several years, with the maximum amount rising each year until it reached $10,000 in 2016. After an election in 2012, the next government announced it would indefinitely freeze the maximum at $3,000. While this year’s budget raises the maximum, it does not say if the government plans to continue increasing it until it reaches $10,000. The budget also proposes to amend the definition of "base wages" in the province’s Taxation Act to include any amounts that a person not operating at arm’s length from an employer pays, allocates, grants or awards to an employee because of, or in the course of, an office or employment unless the amount would be excluded if the employer paid, allocated, granted or awarded it. The government uses the definition of base wages to determine which wages are subject to employer contributions to the Quebec Pension Plan, the HSF, the Commission des normes du travail, the Commission de la santé et de la sécurité du travail and under the Act to promote workforce skills development and recognition. The proposed amendment is in response to a Quebec Court of Appeal ruling last year that found, in brief, that the company Pratt & Whitney was not required to pay HSF contributions on the value of taxable stock option benefits provided to its Quebec employees because its parent company, United Technologies Corporation (UTC), granted the stock option to the employees. Although Pratt & Whitney has a business establishment in Quebec, UTC does not, which prevented Revenu Québec from enforcing HSF contribution requirements from it. The government says the change to the definition will not apply to legal cases pending as of June 4 or to notices of objection filed by 4 p.m. on June 4, provided that the reason for the objection was that a person not at arm’s length with an employer, rather than the employer, paid, allocated, granted or awarded an amount to an employee. In the budget, the government also reiterated a previously announced decision to amend its tax regulations to incorporate a proposal in the Feb. 11 federal budget affecting source deduction remittances. The federal government is proposing to raise the thresholds for accelerated remitters in order to reduce the number of payments employers have to remit for source deductions. The thresholds are based on an employer’s average monthly withholding amount in the previous two calendar years. For threshold 1 remitters, the federal budget proposes to increase the threshold from $15,000 to $25,000. For threshold 2, the threshold would rise from $50,000 to $100,000. The change would mean employers with average monthly withholdings of between $25,000 and $100,000 would have to send in remittances twice a month. Employers with average monthly withholdings of $100,000 or more would have to send in their remittances four times a month. The due dates for remittances would not change. Employers with average monthly remittances of less than $25,000 would pay remittances once per month. Currently, only employers with average monthly withholdings of less than $15,000 in the previous two calendar years remit monthly. The previous Quebec government announced the change in its February budget. Quebec will revise its tax regulations to incorporate the proposal once the federal government changes its regulations. It is expected the change would apply to amounts employers withhold starting in 2015. The budget also reiterated an announcement from the February Quebec budget that the province plans to amend its tax legislation to incorporate another federal budget proposal. This one would introduce a non-refundable tax credit for eligible ground, air and marine search and rescue volunteers. allow an eligible individual to claim a 15 per cent non-refundable tax credit based on an amount of $3,000. For Quebec, the tax rate that would be used to determine the amount of the tax credit is currently 16 per cent. The federal government proposes to implement the tax credit this year. Quebec would revise its tax legislation to incorporate the proposal once federal amendments become law.